Grand Traverse Bay and its waterways provide numerous opportunities for boating, fishing, paddling, swimming, and other recreational uses. Traverse City’s clean drinking water comes from east bay, while rural communities benefit from clean groundwater in their wells. The bay and our inland lakes and streams continue to hold their majestic beauty, amplified by every season, rainbow, and sunset. However, several emerging public health risks such as PFAS or TCE, coal tar sealants, pharmaceuticals, microplastics, and lead contamination loom over the future of clean water in our region. These contaminants threaten the water we drink, the water we swim in, the water we fish in, and the water we simply enjoy. If you believe that clean water is vitally connected to every aspect of our lives, I humbly ask you to join us by making a financial contribution. Donations from people like you go directly toward implementing on-the-ground restoration projects, learning more about emerging public health threats so we can take action, and advocating for policies and procedures that protect clean water. Every gift strengthens our efforts, and we look forward to sharing that impact with you throughout the year. Simply put, water is life. Our health, wealth, and happiness depend on it. 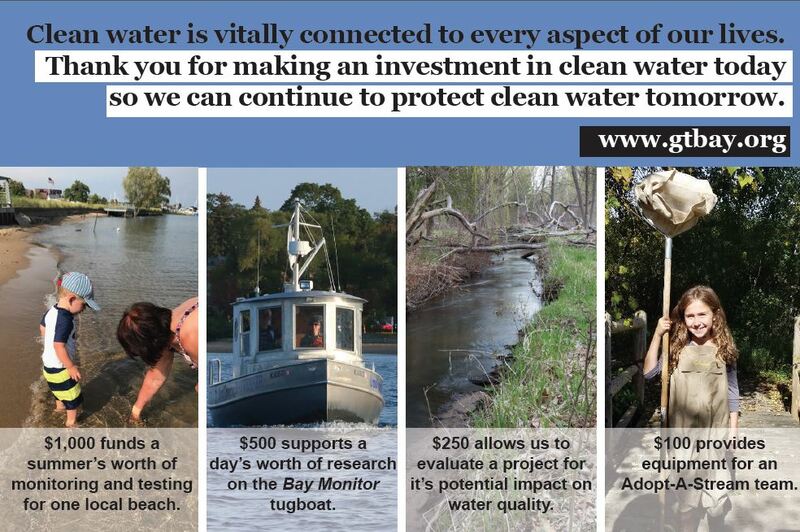 Thank you for making an investment in clean water today so we can continue to protect clean water tomorrow. For more information about the impact your financial contribution can, you can reach me at ccrissman@gtbay.org or 231.935.1514 x1.